Buy 1 for $11.33Buy 2 / Save $0.61!Buy 3 / Save $2.27! 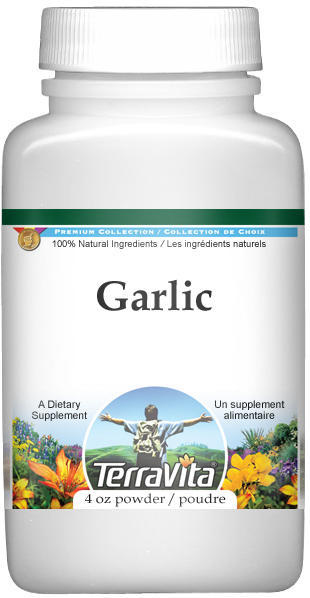 Garlic is a powerful anti-bacterial - it is also anti-viral and anti-fungal. It detoxifies the body and supports all body functions, especially the immune system. Garlic purifies the blood, strengthens blood vessels and lowers blood pressure. It aids in supporting arteriosclerosis, joint pain, colds, flu, heart disorders, digestive problems, insomnia, liver problem, sinusitis, ulcers and yeast infections. This herb contains allicin, allyl disulphides, calcium, copper, essential oils, germanium, iron, magnesium, manganese, phosphorus, potassium, selenium, sulphur, unsaturated aldehydes, zinc, vitamins A, B1, B2 and C.
Do not use in combination with blood-thinning drugs without professional medical advice. Gastrointestinal disturbance may occur in sensitive people.